Objective To evaluate the effectiveness of home delivered pragmatic rehabilitation—a programme of gradually increasing activity designed collaboratively by the patient and the therapist—and supportive listening—an approach based on non-directive counselling—for patients in primary care with chronic fatigue syndrome/myalgic encephalomyelitis or encephalitis (CFS/ME). Setting 186 general practices across the north west of England between February 2005 and May 2007. Participants 296 patients aged 18 or over with CFS/ME (median illness duration seven years) diagnosed using the Oxford criteria. Interventions Participants were randomly allocated to pragmatic rehabilitation, supportive listening, or general practitioner treatment as usual. Both therapies were delivered at home in 10 sessions over 18 weeks by one of three adult specialty general nurses who had received four months’ training, including supervised practice, in each of the interventions. GP treatment as usual was unconstrained except that patients were not to be referred for systematic psychological therapies during the treatment period. Main outcome measures The primary clinical outcomes were fatigue and physical functioning at the end of treatment (20 weeks) and 70 weeks from recruitment compared with GP treatment as usual. Lower fatigue scores and higher physical functioning scores denote better outcomes. Results A total of 257 (87%) of the 296 patients who entered the trial were assessed at 70 weeks, the primary outcome point. Analysis was on an intention to treat basis, with robust treatment effects estimated after adjustment for missing data using probability weights. Immediately after treatment (at 20 weeks), patients allocated to pragmatic rehabilitation (n=95) had significantly improved fatigue (effect estimate -1.18, 95% confidence interval -2.18 to -0.18; P=0.021) but not physical functioning (-0.18, 95% CI -5.88 to +5.52; P=0.950) compared with patients allocated to treatment as usual (n=100). At one year after finishing treatment (70 weeks), there were no statistically significant differences in fatigue or physical functioning between patients allocated to pragmatic rehabilitation and those on treatment as usual (-1.00, 95% CI -2.10 to +0.11; P=0.076 and +2.57, 95% CI 3.90 to +9.03; P=0.435). At 20 weeks, patients allocated to supportive listening (n=101) had poorer physical functioning than those allocated to treatment as usual (-7.54, 95% CI -12.76 to -2.33; P=0.005) and no difference in fatigue. At 70 weeks, patients allocated to supportive listening did not differ significantly from those allocated to treatment as usual on either primary outcome. Conclusions For patients with CFS/ME in primary care, pragmatic rehabilitation delivered by trained nurse therapists improves fatigue in the short term compared with unconstrained GP treatment as usual, but the effect is small and not statistically significant at one year follow-up. Supportive listening delivered by trained nurse therapists is not an effective treatment for CFS/ME. Trial registration International Standard Randomised Controlled Trial Number IRCTN74156610. In 2001, we reported a new educational self help treatment for CFS/ME called pragmatic rehabilitation. This treatment had proved successful in a hospital based trial, with 57% of patients who received pragmatic rehabilitation recovering after 12 months compared with 6% of patients in a waiting list control group.13 Pragmatic rehabilitation has elements in common with cognitive behavioural therapy and graded exercise therapy, but does not require delivery by cognitive behavioural therapists or physiotherapists. Whereas cognitive behavioural therapy usually starts with an individualised formulation of the patient’s problem(s), pragmatic rehabilitation starts with the more didactic presentation of an explanatory model of CFS/ME, which provides the rationale for a graded increase in activity. The pragmatic rehabilitation activity programme is devised collaboratively with the patient rather than prescribed on the basis of exercise testing, as in graded exercise therapy. We aimed to determine whether pragmatic rehabilitation delivered in primary care by general nurses who had received training in the technique would be an effective therapy compared with treatment as usual by the general practitioner (GP). We added a third arm to our trial, supportive listening, to control for supportive therapist contact time and to allow a comparison with a therapy that is widely available in primary care.14 A previous primary care study showed that counselling was as effective as cognitive behavioural therapy for a broader group of patients with chronic fatigue,15 although counselling based therapies have not previously been trialled for CFS/ME. Patients aged 18 or over who fulfilled the Oxford criteria for CFS/ME,1 scored 70% or less on the SF-36 physical functioning scale,18 and scored four or more on the Chalder et al fatigue scale19 were recruited from 186 general practices across the north west of England between February 2005 and May 2007. The Oxford criteria1 require that patients have a principal complaint of fatigue unexplained by other medical and psychiatric conditions. The fatigue must be of definite onset, affect both physical and mental functioning, and have been present for more than 50% of the time over the past six months. Patients were excluded if they fulfilled diagnostic criteria for antisocial, borderline, or paranoid personality disorders,20 had active suicidal ideation, were unable to read or write English, were currently undertaking systematic psychological therapies for CFS/ME, or had received pragmatic rehabilitation in the past year. Referred patients were sent trial information in the post, which included brief details of all three treatment arms, and were telephoned one week later to ascertain whether they agreed to take part in the trial. Where patients declined to participate, the reasons for refusal were recorded. After providing informed consent, patients were assessed at home and their eligibility determined by a research assistant. Eligibility was confirmed via consultation with clinically qualified members of the team if there were any queries about inclusion or exclusion criteria. Details of eligible patients were provided by telephone to an independent randomisation service within two working days. Individual patients were randomly allocated to one of the three treatment arms using computer generated randomised permuted blocks (with randomly varying block sizes of 9, 12, 15, and 18), after stratification on the basis of whether the patient was non-ambulatory (used a mobility aid on most days) and whether the patient fulfilled London ME criteria.21 The London ME criteria were developed in conjunction with members of patient support groups. We stratified participants according to these criteria to enable us to address the possibility that people fulfilling London ME criteria are different from the rest of the sample. Where applicable, patients were assigned to therapists in a simple random fashion. The random allocation was emailed to the trial manager, who assigned each patient a unique study number and notified the designated nurse therapist if the patient had been allocated to a therapy arm. The pragmatic rehabilitation and supportive listening treatments consisted of 10 sessions over an 18 week period. Each programme comprised a 90 minute home visit on week 1; one hour home visits on weeks 2, 4, 10, and 19; and 30 minute telephone calls on weeks 3, 6, 8, 12, and 15. We delivered the treatment in patients’ homes to enable inclusion of more severely affected patients who might not otherwise access treatment and to assist with recruitment and retention. Both face to face and telephone therapy sessions were taped. Patients in the pragmatic rehabilitation and supportive listening arms were free to consult their GP during the course of treatment. The treatments are described in our protocol16 and in table 1⇓. Therapy was delivered by three registered, adult specialty, general nurses who had worked in primary care but had no previous experience of CFS/ME. All three nurses delivered both pragmatic rehabilitation and supportive listening. Four months of training in each intervention was provided over a six month period (box), with a period of two months when both interventions were taught and practised in parallel (with four volunteer patients per therapy). Training for pragmatic rehabilitation was provided by members of the trial team (members of the trial team (RPB, RKM, SP, AJW, CD, and CCG) and Pauline Powell, a member of the Fatigue Intervention by Nurses Evaluation (FINE) trial group), and training for supportive listening was provided by experienced counsellors (Diana Jerman, counselling trainer, and David Quarmby, counselling supervisor, both members of the FINE trial group). How to read research papers. Randomised controlled trials, ethical issues, informed consent. Overview of therapy and outcomes. The pragmatic rehabilitation model and the importance of providing rationales. Deconditioning: the rationale for treatment, designing an activity programme, and goal setting. Sleep, cortisol, circadian rhythms: the physiology. Sleep, cortisol, circadian rhythms: the rationale for treatment, regularising sleep patterns, and goal setting. The structure of treatment—how to use the visits and phone calls. Delivering the rationale. Agenda setting. Using techniques from motivational interviewing. Psychosocial issues—helping people to look to the future, termination of therapy. Summary, overview and getting ready to start working with practice patients. Supervision contracts. Rehabilitation issues (back to work). Follow up 1—Learning from practice. Follow up 2—Learning from practice. Introduction to supportive listening, diary keeping, confidentiality, codes of conduct, and use of supervision. Background to person centred listening, core conditions, and listening skills. What counselling is not. Qualities of the listener. Beginning therapy, engagement, and the patient’s frame of reference. Stages of the listening relationship. Helping the patient to tell a story. Attending and listening, body language, and non-verbal messages. Reflecting back. Open questions and role plays. Group discussion of learning and insights. Challenge and specificity. Skills practice. Practice patients started. Supportive listening supervision sessions started. Creating an emotional and physical environment conducive to the helping relationship. Telephone counselling skills—review and practice. Review of progress, identification of further training needs. Group work. Taking action. Endings. Follow up 1—Reviewing practice. Boundaries. Follow up 2—Reviewing practice. Transference issues. Training sessions used a mixture of presentations by the trainers, discussion, group activities, role play, videos, and review of case material. Reading lists were given. Homework was set in some sessions and reviewed at the next session. Abbreviations: CFS/ME, chronic fatigue syndrome/myalgic encephalomyelitis or encephalitis; FINE, Fatigue Intervention by Nurses Evaluation. Fortnightly group and individual supervision was provided while the therapists were treating patients. Supervision for pragmatic rehabilitation was provided in group meetings held approximately fortnightly by RKM, a psychiatrist with extensive experience of treating CFS/ME, and supplemented by occasional individual supervision sessions by RPB, a clinical psychologist, experienced cognitive behavioural therapist, and one of the people who designed the original intervention in secondary care. Supervision for supportive listening was provided in meetings held approximately fortnightly individually by DQ and supplemented by occasional group supervision meetings (DQ and DJ, both qualified and experienced counsellors). Treatment fidelity and quality were assessed during discussion of individual cases and, in the case of pragmatic rehabilitation, with frequent reference to the pragmatic rehabilitation manual. Additionally, 85 tapes of face to face therapy sessions from 21 patients (11 receiving pragmatic rehabilitation and 10 on supportive listening) were selected at random from early and late stages of the trial. Sessions were rated for fidelity and quality by five raters, all of whom were blind to treatment allocation. Four of the five raters were independent of the trial. Raters were given a brief, point by point description of each treatment and asked to use this information to determine which treatment had been delivered. They were then asked to judge the extent to which the essential components of the treatments had been delivered by using a set of criteria predetermined by the trial team. Finally, raters were asked to make a judgment on the quality of delivery of the components. Patients were assessed at entry to the trial (week 0), after treatment (week 20), and one year after finishing treatment (70 weeks from recruitment). Assessments were performed by trained researchers blind to treatment allocation; any unblindings were recorded. The assessors were trained by an academic psychiatrist (RKM) who has many years’ experience of using the screening interview. Training included the use of videos and practice rating sessions. Further training was provided midway through the trial to ensure continued competence. Primary clinical outcomes were percentage scores on the SF-36 physical functioning scale,18 where higher scores indicate better outcomes, and on the 11 item Chalder et al fatigue scale,19 where lower scores indicate better outcomes. Each item on the fatigue scale was scored dichotomously on a four point scale (0, 0, 1, or 1); total scores of four or more on the fatigue scale designate clinically significant levels of fatigue. Secondary outcomes were anxiety and depression, as measured by the anxiety and depression subscales of the hospital anxiety and depression scales (HADS; lower scores indicate better outcomes),24 and level of sleep problems, as measured by scores on the four item Jenkins et al sleep scale (lower scores indicate better outcomes).25 Our assessment also included a full economic evaluation of the relative cost effectiveness of pragmatic rehabilitation and supportive listening when compared with treatment as usual, the results of which will be reported separately. We aimed to recruit 360 patients, a figure based on an estimated 20 percentage point difference in improvement rate between the pragmatic rehabilitation and the GP treatment as usual arms (50% improvement versus 30% improvement). A sample of this size would give 80% power with a two sided significance level of P=0.05 and allow for loss to follow-up of 23%. In accordance with our protocol, “improvement” was defined as scoring less than four on the fatigue scale or improving by 50% or more or scoring 75% or more on the SF-36 physical functioning scale.16 We revised our recruitment target to 288 in September 2006 when it became clear that our loss to follow-up was less than anticipated (13% at 70 weeks). Data were analysed in accordance with our analysis plan16 and the CONSORT guidelines,17 with between group comparisons analysed on an intention to treat basis. Analysis of covariance was used to allow for stratification by ambulatory status and London ME criteria. The baseline value of the relevant outcome measure was entered as a covariate. Firstly, a global test of equality of the three groups was undertaken for each outcome measure in a complete case analysis. If the groups differed, pragmatic rehabilitation was compared with supportive listening. Secondly, if pragmatic rehabilitation and supportive listening were equivalent, both approaches were compared with GP treatment as usual. If pragmatic rehabilitation and supportive listening differed, they were compared individually with GP treatment as usual. The final analyses involved generating both robust standard errors and corresponding confidence intervals for the treatment effect estimates, together with weighting adjustments to allow for missing outcomes.26 27 Potential biases in treatment effect estimates arising from missing outcome data were investigated using inverse probability weighting.26 27 This assumes that the mechanism for missing data is ignorable—that is, data are missing at random.28 Standard errors and 95% confidence intervals for parameters were calculated using robust (sandwich) estimators, allowing for the effects of the inverse probability weights and possible skewness (lack of normality) of the outcome data. All formal analyses were carried out using Stata version 9. A total of 449 patients were referred to the trial by their GPs; 78 (17%) declined to be assessed, 15 (3%) were erroneous referrals, and 18 (4%) were ineligible for assessment. Thus 338 patients underwent baseline assessment, after which 42 (12.4%) were excluded, leaving 296 patients to be randomised. Participant flow through the trial, including allocation to therapists, is shown in figure 1⇓. Three quarters (230/296 (78%)) of our sample were female. The mean age was 44.6 years (SD 11.4). The median illness duration was 7 years (range 0.5-51.7 years, interquartile range 3.2-12.3). Thirty three patients (11%) were non-ambulatory, and 92 (31%) fulfilled London ME criteria. Townsend deprivation scores ranged from -7 to 13. Eighty eight (29.7%) patients had any anxiety and/or any depression diagnosis. Seventy four patients (25%) had one self reported medical comorbidity that did not explain their fatigue, and 108 patients (36.5%) had two or more comorbidities. The top three categories of medical comorbidity were musculoskeletal disorders (63/296 (21.3%)), gastrointestinal problems including irritable bowel syndrome (45/296 (5.2%)), and cardiovascular diseases such as hypercholesterolaemia (41/296 (13.9%)). Descriptive statistics for patients allocated to each treatment arm can be seen in table 2⇓. In accordance with our analysis plan, we did not evaluate differences in demographic variables between the three treatment groups. The mean number of sessions delivered was 9.63 (SD 0.88) for patients who completed pragmatic rehabilitation treatment and 9.5 (0.83) for those receiving supportive listening. According to patient reports, patients allocated to general practice treatment as usual had a median of three (range 0-16) consultations with their GPs during the 18 week treatment period, compared with two (0-14) for the pragmatic rehabilitation group and three (0-23) in the supportive listening group. The median number of visits to practice nurses were 0 (range 0-22) for patients allocated to GP treatment as usual, 0 (0-4) for those receiving pragmatic rehabilitation, and 0 (0-5) for those on supportive listening. We achieved high treatment fidelity—that is, nearly all sessions were congruent with the predefined structure and content of each therapy. Blind raters correctly identified 42 (100%) of the 42 pragmatic rehabilitation sessions and 40 (93%) of the 43 supportive listening sessions. Sessions were rated for quality on a 7 point scale from 1 (unacceptable) to 7 (excellent). The mean ratings were 5.24 for pragmatic rehabilitation (SD 0.93) and 4.4 for supportive listening (0.98). There were no significant between therapist differences on quality ratings for either therapy. Preliminary analysis indicated that the main predictor of failure to provide follow-up data was whether the participant withdrew from treatment (not applicable to GP treatment as usual). Inverse probability weights to adjust for these missing data were, therefore, calculated separately for participants who completed therapy and those who withdrew from treatment in both the pragmatic rehabilitation and supportive listening arms. A single weight was calculated for the GP treatment as usual arm. The adjustment weights are simply the reciprocal of the proportion of relevant participants who provided an observed outcome. In the initial unweighted (complete case) analysis at 20 weeks, global tests of equality and contrasts showed between group differences in fatigue (F2268=4.49; P=0.012), physical functioning (F2267=5.36; P=0.005), depression (F2268=5.03; P=0.007), and sleep (F2266=5.99; P=0.003). In all of these cases, patients allocated to pragmatic rehabilitation did significantly better than those receiving supportive listening (fig 2⇓). The final 20 week analyses involved both robust standard errors and corresponding confidence intervals, together with weighting adjustments to allow for missing outcomes. 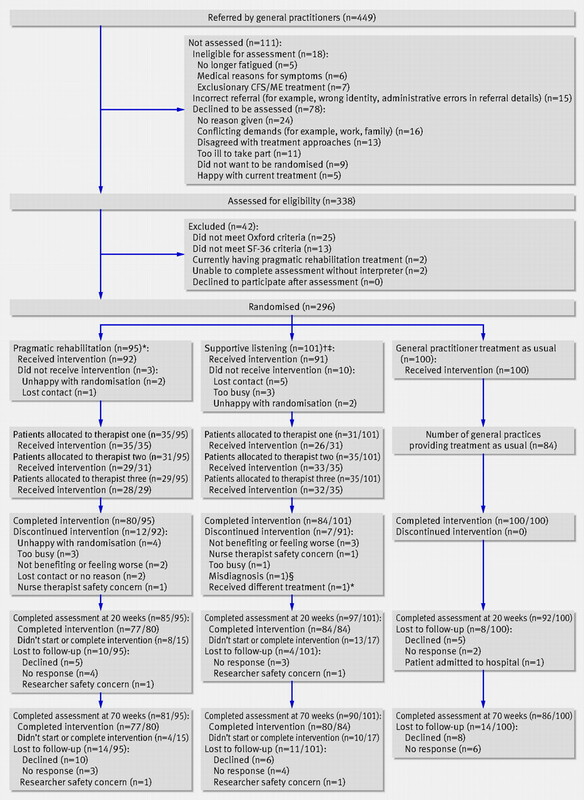 Compared with patients allocated to GP treatment as usual, patients allocated to pragmatic rehabilitation had significantly improved fatigue (treatment effect estimate -1.18, 95% CI -2.18 to -0.18; P=0.021), depression (-1.18, -2.16 to -0.20; P=0.018), and sleep (-1.54, -2.96 to -0.11; P=0.035) at 20 weeks. Patients who received supportive listening had significantly worse physical functioning at 20 weeks than patients who had treatment as usual (-7.54, -12.76 to -2.33; P=0.005); supportive listening had little effect on fatigue, anxiety, depression, or sleep. Estimated differences between the outcomes of pragmatic rehabilitation and GP treatment as usual, and between those of supportive listening and GP treatment as usual, are shown in table 4⇓. A total of 257 (87%) of the 296 patients who entered the trial were assessed at 70 weeks. In the initial unweighted (complete case) analysis at 70 weeks, global tests and contrasts showed a between group difference in physical functioning only (F2,249=3.37; P=0.036). In the final weighted analysis at 70 weeks, patients allocated to pragmatic rehabilitation did not differ significantly in physical functioning from those allocated to GP treatment as usual (effect +2.57, 95% CI -3.90 to +9.03; P=0.435; table 4). The treatment difference in terms of fatigue was no longer statistically significant at 70 weeks (-1.00, -2.10 to +0.11; P=0.076), although much of the improvement in the pragmatic rehabilitation group seen at 20 weeks appeared to be maintained. Supportive listening did not differ significantly from GP treatment as usual on any of the outcomes at 70 weeks. At 70 weeks, 11 patients allocated to pragmatic rehabilitation (14%) and six patients (7%) allocated to GP treatment as usual were no longer classified as cases of fatigue (that is, scored less than 4 on the fatigue scale). A total of 17 patients allocated to pragmatic rehabilitation (21%) were classified as having improved on the physical functioning scale (that is, had scores of >70%, or had improved by 50% from baseline),16 compared with 10 patients (12%) allocated to GP treatment as usual. One patient developed a herpes simplex infection during the treatment. During the follow-up period, one patient attempted suicide, one developed a bleeding peptic ulcer, and one had a recurrence of cancer. Our independent data monitoring committee was informed of all these events and considered them unrelated to the trial treatments. We report on the largest primary care treatment trial for CFS/ME to date, which has a broad and inclusive sample of patients with a range of levels of disability. Our study shows that, when compared with treatment as usual, pragmatic rehabilitation has a statistically significant but clinically modest beneficial effect on fatigue at the end of treatment (20 weeks), which is mostly maintained but no longer statistically significant at one year after finishing treatment (70 weeks). Pragmatic rehabilitation did not significantly improve our other primary outcome, physical functioning, at either 20 weeks or 70 weeks. Improvements in sleep at 20 weeks were considerably smaller and no longer statistically significant at 70 weeks, and improvements in depression at 20 weeks were no longer observed at 70 weeks. Pragmatic rehabilitation did not have an effect on anxiety. When compared with GP treatment as usual at 20 weeks, supportive listening had no significant effect on fatigue, anxiety, depression, or sleep. Supportive listening did have a significant effect on physical functioning, however, with patients allocated to supportive listening having worse scores. At 70 weeks, supportive listening did not differ from GP treatment as usual on any of the outcomes. Our first conclusion is that pragmatic rehabilitation improved fatigue, sleep, and depression while treatment was ongoing, but that the effects were no longer statistically significant at follow-up. Pragmatic rehabilitation was less effective in our trial than in a previous secondary care trial,13 and the proportions of patients who had recovered in terms of fatigue and physical functioning scores at 70 weeks were smaller. We suggest five possible reasons why pragmatic rehabilitation was not as effective in our trial as in the earlier secondary care trial. Firstly, the characteristics of the patients in the two trials differ. Our patients were on average eight years older than those in the earlier trial. The mean illness duration in our trial (84 months) was almost three years longer than that in the earlier trial (52 months), and some patients in our study had very long illness durations. The mean baseline physical functioning scores among our patients (~30%) were similar to those reported in the previous trial (~16 on a 10-30 scale). We succeeded in our aim of including more severely affected patients, however, meaning that our sample was heterogeneous with regard to disease severity and contained patients from across the spectrum of severity. For example, 11% of patients in our trial were non-ambulatory and would have been excluded from a secondary care trial. Secondly, ours was a pragmatic trial, and we were broad and inclusive in the application of our trial inclusion criteria. For example, we did not require that patients had received previous treatment for depression or sleep problems in order to enter our trial, unlike in a previous study.30 We included complex cases with medical or psychiatric comorbidities (which we report), as long as these disorders did not explain the fatigue. Ten participants in the trial, including four allocated to the pragmatic rehabilitation arm, had received pragmatic rehabilitation more than one year before entering our trial but still had CFS/ME, so may have been particularly difficult to treat. Although our profile of scores on the hospital anxiety and depression scales is similar to that in another UK primary care sample,31 illness duration was longer in our study and we included a substantial number of patients with medical comorbidities, which may have complicated treatment. The latter are rarely reported in clinical trials, making a comparison of samples difficult. Future studies or analyses may examine the impact of comorbidites, level of disability, and chronicity on patient response to pragmatic rehabilitation treatment. Thirdly, in the secondary care trial of pragmatic rehabilitation,13 the therapy was delivered by an experienced counsellor who had developed the pragmatic rehabilitation treatment. In our trial, pragmatic rehabilitation was delivered by three general nurses who had no previous experience of either counselling or delivering structured therapies. The nurses received four months of training so had learned the therapy rather than developed it. Although our therapy quality ratings showed our therapists to be competent, they were not as experienced at delivering the therapy as was the practitioner in the previous trial. Additionally, the nurses were treating a heterogeneous sample and had to deal with a wide range of patient functioning. The evidence as to whether inexperienced therapists can successfully treat CFS/ME is limited: a recent benchmarking study suggests they can,32 but that treatment effects are generally larger with more experienced therapists. It is possible that the more complex and difficult cases of CFS/ME can only be treated successfully by experienced therapists. Fourthly, although delivering the treatment in patients’ homes enabled us to reach more patients than if the therapy had been delivered in a healthcare setting, this approach may be non-optimal. Our nurse therapists encountered various social barriers to treatment in patients’ homes, such as family and financial problems, and lack of privacy. It is possible that patients with social problems are screened out in secondary care studies, or that social problems are dealt with before referrals are made or patients are accepted for treatment. It is also possible that delivering treatment in patients’ homes subtly changes the relationship between patients and therapists so that patients are less likely to adhere to the pragmatic rehabilitation programme when at home than when in a hospital setting. Finally, our treatment period may have been too short for patients with long illness durations, and treatment effects may have been enhanced had we been able to provide post-treatment booster sessions. We chose the duration of treatment on pragmatic grounds, taking into account the feasibility of reproducing the treatment programme in primary care services. One reason for conducting our trial was to see whether registered adult specialty general nurses could be trained to deliver pragmatic rehabilitation. Our findings suggest that they could, but that despite an intensive four month training period and ongoing supervision, pragmatic rehabilitation treatment was not as effective as when delivered by a highly experienced therapist in secondary care. Furthermore, our therapists had a high frequency of supervision which might not be reproducible in non-trial contexts, and would be difficult to commission. The finding that supportive listening is not an effective treatment for CFS/ME in primary care is important, because treatments similar to supportive listening are commonly available in primary care and patients for whom no other treatment is available might be referred to them. Contrary to our expectations, supportive listening did not improve any of our outcomes, including anxiety and depression. Ridsdale et al showed that counselling was as effective as cognitive behavioural therapy for chronic fatigue in primary care.15 Only a quarter of the patients in Ridsdale and colleagues’ study had CFS/ME, however, and the duration of fatigue was shorter than in our study (median illness duration 38 months compared with 84 months in our trial). Furthermore, the trial did not have a treatment as usual control group and the counselling treatment may not have been as non-directive as ours. In addition to being a large, inclusive, pragmatic, primary care trial, our study had other strengths. We trained general nurses to deliver the therapy, thus increasing the generalisability of our findings. Using all three nurse therapists to deliver both treatments allowed us to determine the effectiveness of the therapies rather than the therapists, and the random allocation of patients to therapists will enable us to examine therapist effects in a future analysis. Our nurse therapists achieved high treatment fidelity and the delivery of the two treatments was of comparable quality. We had low dropout rates, and high rates of follow-up. The interpretation of our findings is aided by the inclusion of both a comparison arm (supportive listening) and a treatment as usual control arm. 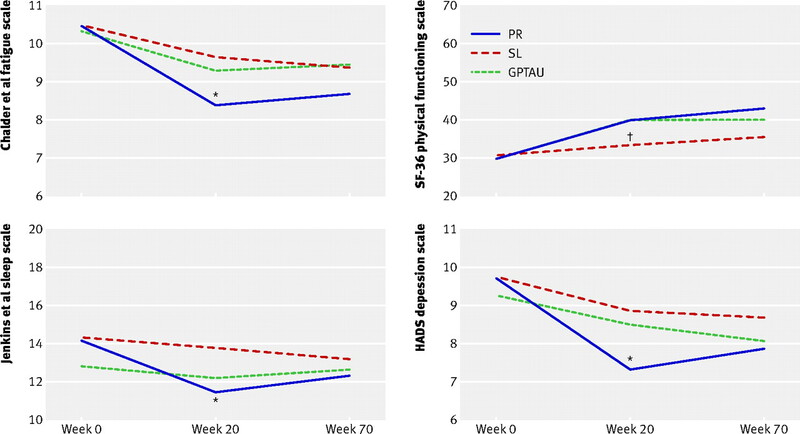 Pragmatic rehabilitation delivered at home by trained general nurses over a period of 18 weeks improved fatigue, sleep, and depression among patients with CFS/ME, but these effects were not maintained in the long term once treatment was completed. Supportive listening delivered by trained general nurses was not an effective treatment for CFS/ME in primary care. More studies are needed to determine the optimal conditions under which pragmatic rehabilitation can be delivered to patients in the community with CFS/ME and whether the limited benefits seen in this trial can be sustained. We thank all the patients who took part in the study. We are also grateful for the assistance of the Liverpool Primary Care Trust, the Mersey Primary Care R&D Consortium, and the staff of the186 general practices who referred patients to our study. Contributors: All authors participated in the overall design of the study, were involved in the ongoing management of the trial, contributed to the interpretation of the data, and contributed to several drafts of this report. In addition, AJW, the principal investigator, conceived the study, prepared the protocol, contributed to training of therapists and supervision of researchers, had overall responsibility for the day to day running of the study, interpreted the data, and took the lead on writing the report. AJW also acts as the guarantor for the study. CD and CCG participated in the training of therapists and the recruitment of general practices into the study, and advised on medical exclusions from the trial. RPB and RKM participated in the training and supervision of therapists. RKM also trained the researchers in psychiatric interviewing and advised on psychiatric exclusions from the trial. SP participated in training of therapists and recruitment of patients to the trial. LR was the trial manager, and participated in recruitment and training of research staff. LR was also responsible for staff management and overall coordination of the study. GR was the trial health economist and advised on trial assessments. KL advised on recruitment of patients to the trial and participated in the design and implementation of the therapy rating exercise. GD was the trial statistician, and advised on randomisation and all statistical aspects of the trial, developed the analysis plan, and performed the statistical analysis. All authors had full access to all study data. Funding: The UK Medical Research Council (G200212) and the UK Department of Health funded the trial. The study was sponsored by the University of Manchester. The sponsor and the funder of the study had no role in the study design, data collection and analysis, interpretation or reporting of this work, or the decision to submit the work for publication. All authors are independent of the funding source. Competing interests: All authors have completed the Unified Competing Interest form at www.icmje.org/coi_disclosure.pdf (available on request from the corresponding author) and declare: (1) No financial support for the submitted work from anyone other than their employer; (2) No financial relationships with commercial entities that might have an interest in the submitted work; (3) No spouses, partners, or children with relationships with commercial entities that might have an interest in the submitted work; (4) No non-financial interests that may be relevant to the submitted work. Ethical approval: Ethical approval for this trial was granted by the Eastern Multicentre Research Ethics Committee, reference 03/5/62. Data sharing: We will be happy to make our dataset available to researchers, once we have finished reporting our findings. Please contact the corresponding author. The Fatigue Intervention by Nurses Evaluation (FINE) trial writing group consists of Alison Wearden, Richard Bentall, Carolyn Chew-Graham, Christopher Dowrick, Graham Dunn, Karina Lovell, Richard Morriss, Sarah Peters, Gerry Richardson, and Lisa Riste. The FINE trial group consisted of Colette Bennett, Richard Bentall, Laura Booth, Joanna Brocki, Greg Cahill, Anna Chapman, Carolyn Chew-Graham, Susan Connell, Christopher Dowrick, Graham Dunn, Deborah Fleetwood, Laura Ibbotson, Diana Jerman, Karina Lovell, Jane Mann, Richard Morriss, Sarah Peters, Pauline Powell, David Quarmby, Gerry Richardson, Lisa Riste, Alison Wearden, and Jennifer Williams. Sharpe MC, Archard LC, Banatvala JE, Borysiewicz LK, Clare AW, David A, et al. A report—chronic fatigue syndrome: guidelines for research. J R Soc Med1991;84:118-21. Fukuda K, Straus SE, Hickie I, Sharpe MC, Dobbins JG, Komaroff A, et al. The chronic fatigue syndrome—a comprehensive approach to its definition and study. Ann Intern Med1994;121:953-9. Komaroff AL, Fagioli LR, Doolittle TH, Gandek B, Gleit MA, Guerriero RT, et al. Health status in patients with chronic fatigue syndrome and in general population and disease comparison groups. Am J Med1996;101:281-90. Bombardier CH, Buchwald D. Chronic fatigue, chronic fatigue syndrome, and fibromyalgia—disability and health-care use. Med Care1996;34:924-30. McCrone P, Darbishire L, Ridsdale L, Seed P. The economic cost of chronic fatigue and chronic fatigue syndrome in UK primary care. Psychol Med2003;33:253-61. Department of Health. A report of the CFS/ME working group: report to the chief medical officer of an independent working group. DH, 2002. National Institute for Health and Clinical Excellence. Chronic fatigue syndrome/myalgic encephalomyelitis (or encephalopathy): diagnosis and management (CG53 NIfHaCECG). NICE, 2007. Euba R, Chalder T, Deale A, Wessely S. A comparison of the characteristics of chronic fatigue syndrome in primary and tertiary care. Br J Psychiatry1996;168:121-6. Raine R, Haines A, Sensky T, Hutchings A, Larkin K, Black N. Systematic review of mental health interventions for patients with common somatic symptoms: can research evidence from secondary care be extrapolated to primary care? BMJ2002;325:1082-5. Chambers D, Bagnall AM, Hempel S, Forbes C. Interventions for the treatment, management and rehabilitation of patients with chronic fatigue syndrome/myalgic encephalomyelitis: an updated systematic review. J R Soc Med2006;99:506-20. Price JR, Mitchell E, Tidy E, Hunot V. Cognitive behaviour therapy for chronic fatigue syndrome in adults. Cochrane Database Syst Rev2008;(3):CD001027. Edmonds M, McGuire H, Price J. Exercise therapy for chronic fatigue syndrome. Cochrane Database Syst Rev2004;(3):CD003200. Powell P, Bentall RP, Nye FJ, Edwards KHT. Randomised controlled trial of patient education to encourage graded exercise in chronic fatigue syndrome. BMJ2001;322:387-90. Mellor-Clark J, Simms-Ellis R, Burton M. National survey of counsellors in primary care: evidence for growing professionalisation. Occasional paper 79. Royal College of General Practitioners, 2001. Ridsdale L, Godfrey E, Chalder T, Seed P, King M, Wallace P, et al. Chronic fatigue in general practice: is counselling as good as cognitive behaviour therapy? A UK randomised trial. Br J Gen Pract2001;51:19-24. Wearden AJ, Riste L, Dowrick C, Chew-Graham C, Bentall RP, Morriss RK, et al. Fatigue Intervention by Nurses Evaluation—the FINE Trial. A randomised controlled trial of nurse led self-help treatment for patients in primary care with chronic fatigue syndrome: study protocol. [ISRCTN74156610. ] BMC Med2006;4:9. Ware JE, Sherbourne CD. The MOS 36-item short-form health survey (SF-36).1. Conceptual framework and item selection. Med Care1992;30:473-83. Chalder T, Berelowitz G, Pawlikowska T, Watts L, Wessely S, Wright D, et al. Development of a fatigue scale. J Psychosom Res1993;37:147-53. First MB, Spitzer RL, Gibbon M, Williams JBW. The structured clinical interview for DSM-Iii-R personality disorders (SCID Ii). 1. Description. J Pers Disord1995;9:83-91. National Task Force on Chronic Fatigue Syndrome, Post Viral Fatigue Syndrome and Myalgic Encephalomyelitis. Report from the National Task Force on Chronic Fatigue Syndrome, Post Viral Fatigue Syndrome and Myalgic Encephalomyelitis. Westcare, 1994. First M, Spitzer R, Gibbon M, Williams J. Structured clinical interview for DSM-IV-TR-Axis 1 disorders, research version, non-patient edition (SCID 1/NP). New York State Psychiatric Institute, 2002. Townsend P. Deprivation. J Soc Policy 1987;16:125-46. Jenkins CD, Stanton BA, Niemcryk SJ, Rose RM. A scale for the estimation of sleep problems in clinical research. J Clin Epidemiol1988;41:313-21. Heyting A, Tolboom J, Essers JGA. Statistical handling of drop-outs in longitudinal clinical trials. Stat Med1992;11:2043-61. Everitt B, Pickles A. Statistical aspects of the design and analysis of clinical trials. Imperial College Press, 2004. Little RJA, Rubin DB. Statistical analysis with missing data. Wiley, 2002. Riste L, Wearden A, Chew-Graham C, Dowrick C. Patients’ reports of management of CFS/ME in primary care. Society for Academic Primary Care, 2009. Fulcher KY, White PD. Randomised controlled trial of graded exercise in patients with the chronic fatigue syndrome. BMJ1997;314:1647-52. Darbishire L, Ridsdale L, Seed PT. Distinguishing patients with chronic fatigue from those with chronic fatigue syndrome: a diagnostic study in UK primary care. Br J Gen Pract2003;53:441-5. Scheeres K, Wensing M, Bleijenberg G, Severens JL. Implementing cognitive behavior therapy for chronic fatigue syndrome in mental health care: a costs and outcomes analysis. BMC Health Serv Res2008;8:175. Prins JB, Bleijenberg G, Bazelmans E, Elving LD, de Boo TM, Severens JL, et al. Cognitive behaviour therapy for chronic fatigue syndrome: a multicentre randomised controlled trial. Lancet2001;357:841-7.